To stay straight with the buyer and clear of the courthouse, there are words a seller shouldn't say. "Many sellers don't realize that what they say to induce a buyer to purchase their horse may create an express warranty," warns attorney Tonna Tharp. "In simple terms, express warranty may operate as a money-back guarantee. Under certain circumstances, a dissatisfied buyer who wants to return a horse to the seller may have the legal right to recover the purchase price," says Tharp. If you tell someone that Old Dobbin never bucks, but two days later the old gelding tosses the new owner, you could be in trouble. In fact, the buyer may even be awarded additional damages and attorney fees from the seller. "Since laws are always developing and changing, every situation is slightly different in the eyes of the legal system," says the Kansas City, Mo., lawyer. What shouldn't you say? Don't make a factual statement that makes the buyer want to purchase a horse unless you're willing to refund the money if the horse doesn't work out, Tharp cautions. The most clear-cut (and commonly litigated) example of an express warranty involves soundness. "For example, if a buyer arrives at a seller's home to pay for the horse, only to discover the horse has a swollen hock, the seller should be cautious about what he says," the attorney notes. "If the seller says that the hock is not a problem, he has just created a money-back guarantee that the horse is sound." If the horse is later found to be unsound, the buyer may have a valid claim against the seller for breach of warranty, misrepresentation or fraud. Claims against sellers based upon "breach of an implied warranty" are another common area of dispute. "An implied warranty is created when a buyer purchases a horse for a particular purpose that is known to the seller," Tharp says. "Implied warranties are created by what the seller doesn't say. 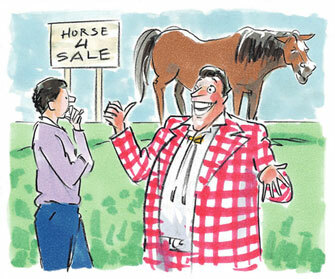 That is, the seller creates an implied warranty if she knows the buyer is purchasing a horse for a particular reason." For instance, if you know the buyer wants a good jumper but you don't mention that the horse can barely make it over a three-foot fence, an implied warranty is created. Show horses and race horses will almost always have an implied warranty of soundness; stallions and broodmares will have an implied warranty of fertility. A horse being purchased for a child has an implied warranty of gentleness. "As a buyer, you can protect yourself in the area of implied warranty by clearly stating to the seller for what purpose you are purchasing the horse," says Tharp. "If the horse is later found to be unsuitable for that purpose, you may have preserved a claim against the seller for breach of implied warranty." The attorney suggests that the seller should ask potential buyers what their intended use of the horse will be. "If you question whether your horse is suitable for that purpose, discuss it with the buyer. A statement like, 'I know you are looking for a horse for your young son to ride. My horse is gentle, but you should know he's never been around children, and I am not sure how he will act' may shift the risk of suitability of the horse to the buyer to determine." Some salesmanship statements won't hold up in court. "To tell a buyer that a horse can win a world championship in five years is merely an opinion. The courts call statements like that puffery. Puffery is an expression of opinion rather than a warranty on the condition of a horse." Mere puffery does not legally create a warranty, Tharp notes. "Use common sense. Can the statmente made be factually proven, or is it realistic?" she asks. "Being straightforward during negotiation is best for everyone. As a buyer, clearly state to the seller for what purpose you're buying the horse. Then if the horse turns out to be unsuitable, you may have a claim against the seller for breach of warranty," Tharp says. If there is a problem with the purchased horse, Tharp notes, keep in mind that important considerations for courts in warranty, misrepresentation and fraud cases involve the amount of control the buyer exerts over the horse, the timeliness of the claim, and whether injury or unfitness of the horse could have occurred once the horse was in the buyer's possession. "Word travels fast in horse circles, and many horse enthusiasts would rather resolve the matter privately," Tharp says. "The best way is to approach the sale or purchase of a horse in a cautious, honest manner." Read the next horse farms article on Tack Theft Prevention.